Story is such a buzzword lately. It even has its own conference. But that’s OK. As a writer, I’m partial to the concept of story. I like it. 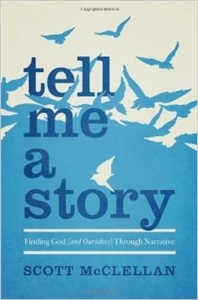 Especially when a book like Tell Me a Story: Finding God (and Ourselves) Through Narrative by Scott McClellan comes along. It looks at life as story and offers inspiration, encouragement and motivation to be worthy storytellers. It’s a great little (only 132 pages) book that condenses and summarizes a lot of the disjointed, buzz worthy and overdone thoughts about story that have floated around in the past few years and shares them in a concise, simple and powerful format. 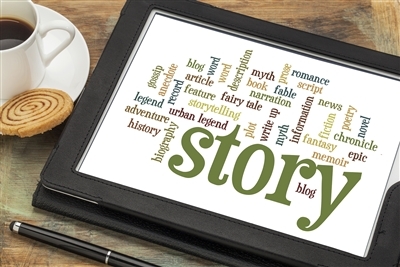 One of the central ideas is that without conflict, you have no story. Our pain, hardship and suffering is what makes the stories of our lives so engaging. Nobody likes a movie where everything is easy. Even in a superhero story where they have super powers to overcome conflict, they still encounter something beyond their super powers. That’s conflict, and it makes things more interesting. As a church we need to be up front about our conflict, our sin, our brokenness. Our communication must acknowledge that brokenness in order for redemption to have any meaning. Dr. Karyn Purvis has a theory that today’s soldiers are suffering from an explosion of post-traumatic stress disorder (PTSD) in part because of their inability to share their story. In World War II soldiers witnessed many of the same traumatizing events, but before returning home to “normal” life they had weeks to decompress with their fellow soldiers, swapping stories over late-night card games or the like. In contrast, today’s soldiers can go from the front line to the home front in less than 24 hours. They can plug in to iPods and check out from the world, missing the opportunity to tell their story, to decompress, to deal with the horrors they’ve experienced. The result, as Purvis suggests, is greater levels of PTSD. It’s certainly not the only cause of increased PTSD, but it’s an intriguing theory. Telling stories is healing. It allows us to understand what happened, good or bad, and come to terms with it. It’s why I have fond memories of my grandpa’s funeral—we sat around telling stories about our dearly departed. And more than just telling stories, we have the story to tell. The gospel is the greatest story ever told. It’s not a mere logical proposition: accept Jesus, get into heaven. No, it’s more than that (and we lose something when we reduce it to mere proposition). The gospel is a story we enter into, a story we’re a part of, a story we contribute to as we live out our lives. That story is powerful. It’s healing. It’s redemptive. It’s life changing. Finally, McClellan tells us that story is to be lived out in community. In church. These are not individual stories that we live alone. They’re interconnected and they find their true power when we come together. Frodo didn’t set out for Mordor by himself. He had the entire fellowship. The story gets better in community. So as a church, what story are you telling? Is it a small story of events and activities or is it a grand story of redemption? Are you sharing the testimonies, the challenges, the tragedies and the triumphs that are happening every day within your congregation? Those are the stories we need to latch onto, because those are the stories that illuminate the grander story, the gospel story. Courtesy of www.churchmarketingsucks.com. Photo courtesy Bigstock. The opinions are those of the author's and do not necessarily reflect the policy or position of the Florida Conference.